Old Testament - Today in Leviticus chapter 14 we read about cleansing from skin diseases and treatment of contaminated houses. I found the treatment of the mildew in the houses quite fascinating - with verse 45 telling us about the ultimatum for a house if the mildew reappears: "It must be torn down, and all its stones, timbers, and plaster must be carried out of town to the place designated as ceremonially unclean." This chapter again goes into the clean & the unclean. If you didn't get chance to read the bible.org commentary on Clean & Unclean from Leviticus chapters 12 through 15, you may want to take a few minutes to read it at this link. Also, a sermon from Peninsula Bible Church with some interesting points on Leviticus chapters 13 & 14 titled "Sick Garments and Diseased Houses" is at this link. 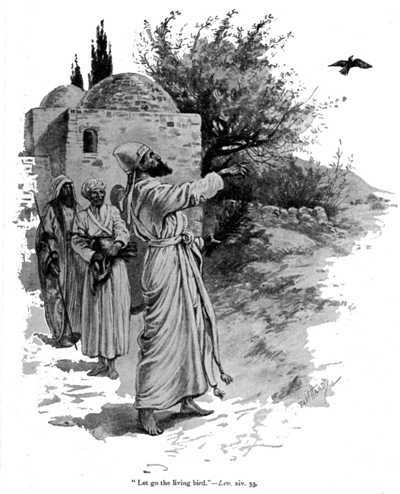 Verses 52 & 53 today: "After he has purified the house in this way, he will release the living bird in the open fields outside the town. In this way, the priest will make atonement for the house, and it will be ceremonially clean." New Testament - Today we read in Mark Chapter 6 verse 46: “Afterward he (Jesus) went up into the hills by himself to pray.” What a beautiful verse for each of us to meditate upon! Jesus went by himself to pray to God. It is interesting to note that this took place just after Jesus fed the 5,000. 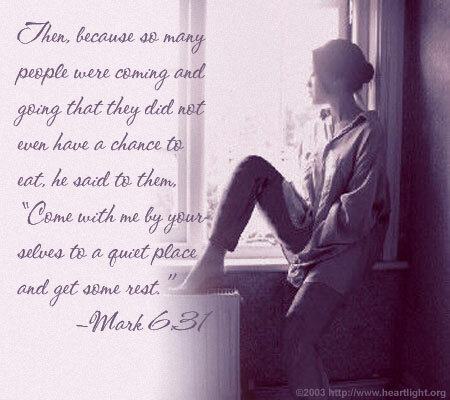 Jesus had been working hard – he is God and yet he still felt the call to pray to the Father. I think this verse is such a great reminder that you and I need to follow Jesus’ example in this verse. And we’re so not God! :) So, think about how much more crucial it is for us to pray. Jesus knew that God was his source of strength. His comfort. His wisdom. And prayer was the one sure fire way for Jesus to really connect and spend time with God. How is your prayer life these days? Are you finding a good amount of time each day to be by yourself and pray? If not, can you schedule this time into your calendar each day? Psalms - Psalm 40 starts off in verse 1 with a beautiful reflection on David "waiting patiently for the Lord" about his prayer, and in turn God "heard his cry." David then goes forward in the Psalm rejoicing in the Lord and culminating in this powerful statement in verse 8: "I desire to do your will, O my God; your law is within my heart." How does this Psalm speak to you today? Do you wait patiently for the Lord in your prayer life? Do you desire to do God's will? 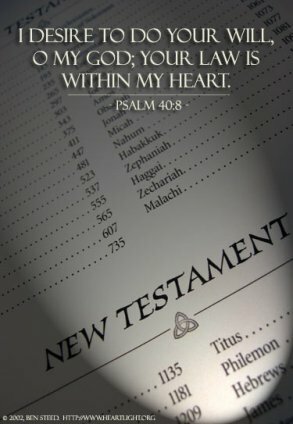 Is His law within your heart today? 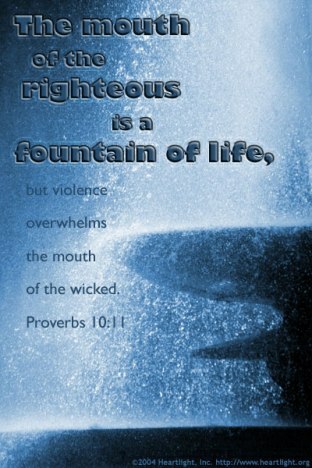 Proverbs - Today we read in Proverbs chapter 10 verse 11: “The mouth of the righteous is a fountain of life.” WOW! I love this Proverb on so many levels. The idea of a “fountain of life” is such a great metaphor! Because I think what comes out of our mouth is so much like a fountain – and we are hopefully pouring forth Living Water for others. However, I imagine that there are times when our fountain is not quite so clean and we’re pouring forth something else. I think what I find so meaningful about this verse is that I have really been convicted of how important and impactful our words are to others. Our words can really build people up – or tear people down if we are not careful. I don’t know about you, but I know there are times in my life when I can be negative with what I say. Then, there are times when I can be very positive and I feel like the enthusiasm is contagious to others. And these are the times when perhaps my words seem to be a bit more like a fountain of life. I say all of this to just encourage you to reflect on the words that come from your mouth. Are you praying? Click here and pray! Prayer Point: Pray that your mouth would be a fountain of life to all you speak to today. Pray that your mouth would be filled with righteousness. Comments from you & Questions of the Day: Per Proverbs 10:11 above, are your words typically a fountain of life to others? Are you cognizant of what you say and how you say it to others around you so that your words truly will become a fountain of life to others? Or are you sometimes careless with your words? Do you think our words matter? Also, what verses or insights stand out to you in today's readings? Please post up by clicking on the "Comments" link below! As I read through the 14th chapter several times, two things kept running through my mind. One was a memory of an event in November 2004 when my apartment walls had to be torn down because of “mold.” Yikes that was tough so I know what it is you have to do to get rid of “leprosy,” on the walls. It ain’t easy. While thinking about this I also realized there was a bigger blessing for one of the ten lepers Jesus cleansed, he turned back to worship and give thanks (Luke 17:12-19). Jesus had sent all ten to the Temple to show themselves to the priests and on the way, all ten were cleansed. Once at the Temple they would have had to participate in the expense and time of the ritual cleansing. This would have put their new beginning of living their lives on hold until the entire ceremony was completed provided they had the finances for bringing the offering for the poor. And as he entered into a certain village, there met him ten men that were lepers, which stood afar off: And they lifted up their voices, and said, Jesus, Master, have mercy on us. And when he saw them, he said unto them, Go show yourselves unto the priests. And it came to pass, that, as they went, they were cleansed. And one of them, when he saw that he was healed, turned back, and with a loud voice glorified God, And fell down on his face at his feet, giving him thanks: and he was a Samaritan. And Jesus answering said, Were there not ten cleansed? but where are the nine? There are not found that returned to give glory to God, save this stranger. And he said unto him, Arise, go thy way: thy faith hath made thee whole. An attitude of gratitude does great wonders. All were cleansed but only one was freed. Ramona, the one cured leper who came back to Jesus actually did exactly as he was told, whether he realized it or not. He did "show himself to the priest," Jesus our great High Priest! The priest at the Temple wouldn't have accepted him, a Samaritan, but Jesus accepted his grateful worship as a sufficient sacrifice and sent him on his way.